Base of Operations Silver Eagle is located in a mountainous region of the Clover Kingdom near an open river and surrounded on three sides by high waterfalls and lush greenery. 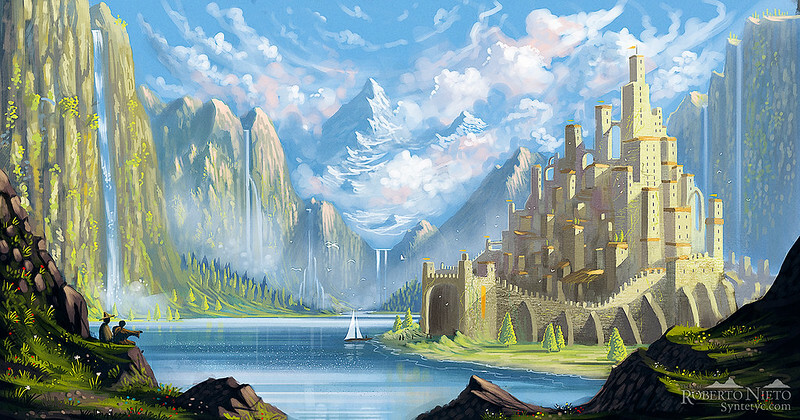 This place is home of all the the Magic Knights who are part of the Silver Eagles and includes all modern ammenities including private bedrooms, public restrooms and baths, kitchens and a dining hall which are both always stocked and has a complete staff of people to cook and take care of everyone lucky enough to be a member of this place. It was built and funded by the House Silva upon the creation of the Silver Eagles squad. The differences and similarities between this pair of individuals was becoming obvious by their movement styles and patterns. A free-spirited show off and a more reserved but equally or higher talented young man. A chuckle escaped Sibylla as Asher explained that he'd been able to fly even as an infant. And shared a story likely shared with him throughout his life. She took comfort in knowing this, but for reasons which likely weren't clear. "I'm sure you would have come down when you wanted to..." mentioned Sibylla because she knew it to be true. It was part of the reason he'd been known to be quite powerful immediately after his birth. Perhaps she'd witnessed such an event herself, regardless Junon seemed to be having quite a bit of fun. "Sugoi!" she mentioned, though whether this was meant for Asher or not would be left up to the imagination as she seemed to be enjoying herself. "Are you curious about the eagle?" she asked the lad taking note of his apparent curiosity. He'd seen it before now, or at least the very small version of it. Soon after this question the Base of Operations for the Silver Eagles would come into view. It looked like a giant waterside castle surrounded on three sides by waterfalls. The nature was pristine, the sky was clear and the whole of the base looked calm. Asher's trip was a smooth one, kept steady by the small bits of conversation had between himself and the others. He wasn't quite sure about his past self's desire to come down from that flight years ago, but he had nothing to go by. Besides, his attentions were set on the eagle spell, which he did in fact feel he recognized. When he looked at it, he could briefly see his own reflection, but... it wasn't a reflection of his current self in his mind; it was a version of him long gone, which Asher himself didn't know. When asked if he was curious, he didn't exactly know what to say. "I... no. I just thought I saw something," he said. Soon enough, he was descending to the base of operations, and stepping up to the front with his own two feet. "Sugoi! We get to live here?!" Junon questioned of this place, which she was looking at. She grew up in the Witch's Forest, but she'd still never seen a building like this one before. It seemed to be only a step or two below that of Clover Castle in sheer volume and size. It was full of winding towers with flags bearing the crest of the House Silva, and by association the Silver Eagles. "Hai hai, this is the Silver Eagles base of operations," she said to the pair of them, as she made her descent, cancelling the magic she'd used to fly over, and having it disappear as she stepped onto the grounds. The front door of this giant castle seemed to have several pathways leading up or down into open court yards, practice areas. Several walkways leading down to the waterfront, and out into the woods or mountains depending on terrain preferences. Sibylla stood out in front of this pair as both of them came to their own stops. Junon from ground level looked up at the entire building structure, and beyond this Sibylla would give an opportunity for pause before she began her explanation, besides that she expected at least one other to greet them. There was much to be said about the building they were now upon, but Asher didn't even have enough words in his vocabulary to describe the sight he was taking in. His feet carried him forward to the entrance of the main hall, but he did not yet enter. His senses informed him of another approaching mana, coming down the hall. The splitting shadows soon revealed he who possessed this mana, as the light unveiled a male figure with long, ashen hair, sporting a Silver Eagles robe accented with white feathers. This man's every step brought him closer to Sibylla, whom he'd been expecting to return for some time now. "Okaerinasai, onee-sama. Did you acquire any good selections this yea-" His sentence fell just shy of completion in the moments he took to observe the two youngsters next to the Captain. One of them in particular was nigh unmistakable, if by nothing other than the strange rainbow effect of his hair. His eyes widened before his gaze returned to the woman he'd referred to as his sister. "Where... have you been?" Junon was also left astounded by this building and she had begun taking steps forward as well only to stop around the same time Asher had. Sibylla knew why they'd stopped and it likely had everything to do with the approaching presence. A wide smile crossed her face, as she was greeted in quite the informal manner by an ashen haired man who bore enough resemblance to her to be fully acknowledged as some sort of relation, though his greeting gave away its exactness. "Tadaima, Dior." The sentence left Sibylla's face but there was much calm after, because this she got to watch as her brother saw who she'd brought with her. There was extreme recognition in his face, as she fully expected there to be, since he was only a few years younger than she was. At his question a gentle smile came to her face, and thought there was much excitement in those silver eyes of hers, there was caution to come from her explanation. "I went where I was supposed to go, to the Magic Knights Exam, and then after to pick up our other candidate," she said pausing. She figured formal introductions were in order. "This is Dior Silva, he's the Vice-Captain of the Silver Eagles and quite obviously by now my younger brother," she said making Junon nod her appreciation of this situation. "Dior this is Junon Evanglista, she's the witch who wanted to be a Magic Knight but didn't want to end up in the coven that is Purple Orca. She's a free spirit, and an amazing find. And this... " she said cutting her eyes at the boy with the rainbow hair, while Junon bowed to her introduction without saying much else. "Is Asher, just as talented and put on a very interesting display for the Captains. In fact... everyone tried to get him," she mentioned in a manner most casual. "Tread lightly, Dior... I haven't gotten to explain everything yet," she said. This could have been applied to a great many things, not the least of which would have been how this building functioned where these teens would be staying and all other manner of things including their duties. But in this case, and with steely resolve tinting her eyes, she meant only to convey their younger brother's current ignorance to their kinship. This was something Sibylla wanted to bring up gently as she wasn't entirely sure of the lad's reactions. She'd spent her most of her conscious life looking for him, had dedicated her life to becoming a Magic Knight and then Magic Knight Captain just to find him, but she couldn't burden him with that knowledge. In fact, she hadn't mentioned it yet because it seemed like a lot of stress to put the lad through initially. Her bond with her siblings was close enough that she figured Dior would take this hint directly without further prodding. Dior was revealed as the name belonging to this Silver Eagle. His expression remained unchanged for some time to come, as Sibylla claimed she had only gone to the places she claimed she would be going initially. With what he knew about their potential witch recruiting, only one option remained for how she'd ended up locating their missing sibling. "Really now? After all that time, that is how you ended up completing that journey? I'm not sure whether we should be happy or... frankly, disturbed," he commented. It quickly became tough to fight against a powerful grin that wanted to spread itself across his visage, but he felt he was managing it well enough. Hearing that the brother they'd lost had managed such success in the Magic Knights Entrance Exam was a point of pride, even though Asher wouldn't understand why said pride truly existed if he knew it. Sadly, he would not even begin to understand just yet. Sibylla warned Dior of the fact that she'd yet to share this crucial bit of information to their brother, and he could certainly understand why this was the case. It had to be somewhat jarring to take that sort of information in. But, he trusted the woman to find the right time and place eventually. "Well, don't make us wait another two decades. By the way, this may not be the best time, but they have confirmed the appearance of that dungeon on the way to Sosshi Village. We've been tasked with investigating it." It seemed her younger brother also found the irony of her journey ending this way. She'd spent almost two decades searching for this lad, only to have him practically turn up on their doorstep. She was glad about this and continued her conversation with Dior about this lad's happenstance. "I've been going with a bit of both mixed with my general surprise," she said in all honesty. All of her normal mannerisms had gone out the window the moment this lad had stepped before her. She'd even spoken whole sentences in front of people and that wasn't something she did lightly. As their conversation progressed it seemed that she would be teased at least lightly by her younger brother in a way that most wouldn't really understand. "I know I know... I promise I won't make us wait so long..." she said though she did want to at least give the lad some time to settle into his duties and life as it was before she confronted him with such information. She didn't know if it would affect how he felt if she told him now, and it seemed like she wouldn't get a chance to. "I'm surprised they handed that off to me," she said about the dungeon. "Wait aren't dungeons like high mana concentration areas with like lost treasure, traps and all kinds of cool stuff?! I've always wanted to see one of those!!" this was a question and excited utterance from Junon which made a small smile come to Sibylla's face. "Hai, that is exactly what they are... Actually," she eyed this pair of young people curiously. Both had goals that would lead them into the loftiest of reaches, but Sibylla was considering something almost unheard of. "How would the pair of you feel about a trial by fire? We usually do in house confirmations even after making a choice to see how you work together. But going out and getting some field experience in a dungeon might work out for the pair of you. Especially if you manage to pick up any of those magical treasures," she said absently. Having just found her younger brother though, Sibylla was prone to anxiety at the idea of letting him out into the harshness of the world again so soon. But she masked this worry behind an explanation of sorts. "Dungeons are dangerous though, so I'd be sending someone else with you to answer your questions and help along in your experience. Dior would you go with them as their lead? You're the only person I can trust with this, well aside from myself..." she said technically speaking Sibylla was known to be quite protective of her siblings. She'd been a very large part in Dior's rise as a Magic Knight and had him as part of her elite forces to keep an eye on him. And accompanied him on missions even before then. "I'll make sure you remember that promise," Dior said when Sibylla claimed she wouldn't have them wait long. Much like her, though obviously not to such a great extent, Dior looked forward to the day he could properly interact with his younger brother after being separated for so long. The longer Sibylla waited to tell the boy the truth, the more of a hassle it would be to have him in reach at all times. Interestingly enough, Sibylla very quickly made the request that Dior accompany Asher and Junon to investigate the new Dungeon their squad had been assigned. It was strange to hear about two new Magic Knights - especially on their first day - being sent on such a task, but since Dior knew he could have done this alone if needed, he could understand going as a chaperone for this pair. "It would be my pleasure. I haven't stretched my legs in a while, and I can more than handle any dangers these two can't by themselves or together." "Hai," this was all that was spoken on the matter of the promise to be made. Of course, she had every intention of revealing to the lad with the rainbow hair the nature of his heritage, but she didn't want to do it, when it could be a disadvantage to him. She understood her nature, and knew the need to look after her younger siblings was probably going to have to take a bit of a hiatus until she gave full details on why she had such behavior. It was going to be a juggling act but... she'd waited almost eighteen years, she could handle finding the right time in the next few days to have this important conversation. But right now the Dungeon was being discussed and it seemed her elder little brother had no problem being a help-hand in her need to meddle as a sibling. Moreover as a senior and a general adviser he'd be able to give more advice and be a much better telling of the boy's skills, abilities and temperaments than the little match up in the exam had been. "Hai, arigatou gozaimasu, Dior." she said feeling exceedingly relieved knowing the pair would be in good hands. She turned to both of them and smiled. "Alright then, I'm sending you three to investigate the Dungeon that appeared at Sosshi Village. You'll be representing the Silver Eagles while you're out so I expect you to act accordingly. Explore, become familiar with your skills and duties, and bring back any important treasures for the good of the Clover Kingdom." These words were expressed firmly but with the same general warmth that Sibylla seemed to possess. "Be careful, and I look forward to your successful return. You can leave when you're ready," she finished with a smile. She had a few parting words for Dior as well. "I'll be waiting for your honest opinion afterwards. You'll likely be more than a bit surprised while you're out, remember to have fun too. And they're brand new so they might have a lot of questions okay? And watch out for traps..." she said, the doting older sister got ready to send out her brothers on a mission together as if it was the very first one. She knew she was worrying unnecessarily but she couldn't help but express it in this moment. All the while Junon's eyes widened. She hadn't expected her new Captain to be so free in giving away adventures. She fully expected to have to earn a more than passing hello to be able to go to a dungeon. It was an exciting prospect and she could only wonder how she managed to find such a compassionate Captain. "Hai, arigatou gozaimasu. Danchou!" she squealed. She could only imagine the sort of thing she'd be able to get into. The types of magic she could see, whatever all these treasures were... all the prospects were exciting. Asher nodded to the Captain, accepting his first mission on his first day of active duty. Rather, this was more like an initiation, considering how it was broached initially. Dior stepped further outside and used his own magic to create a large eagle made of mercury to be ridden when their journey began. As he did this, he looked through the corner of his eye at Sibylla, who was beginning to show every ounce of the genes she inherited from their mother. He struggled to stifle a laugh, but in the end, he chose to tease. "I'll pick them up toothbrushes on the way, and I'll make sure they don't talk to any strangers too." With that said, he mounted the mercury eagle, which he also made large enough for the newcomers to sit upon. "Both of you, get on."